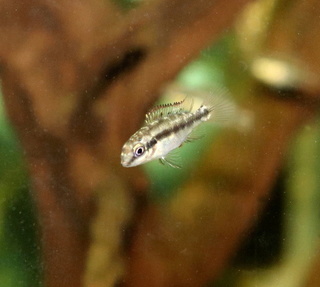 Two nights ago I notice some BGA in my danio tank. This tank is one of my "perfect" tanks and I pretty much ignore it except for water changes weekly. It ALWAYS tests Am 0, nitrites 0, and nitrates <20. I did notice some sunlight creeping thru the blinds lately and I also removed a UV unit two weeks ago. Anyway, last night the entire tank was coated with the pretty blue/green slime. 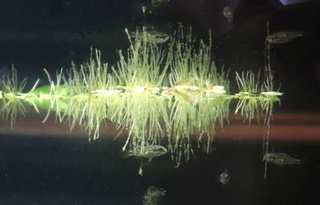 Plants and substrate were covered, and there was even BGA on all the glass which hadn't been there before. It was soo bad that the HOB filter on the back had stopped circulating. I was totally shocked then dismayed. First I did add some Excell at the new tank amount. Then, since I couldn't stand looking at all that algae and knew the Excell wouldn't perform miracles I decided to pull all the plants and décor and clean it up. I tossed the plants, they were mostly water sprite, water wisteria and even some hornwort and I had plenty more in the other tanks. I scrubbed the ornaments and the wood, cleaned the tubes on the filter and with my fingers and a net, collected up all the slime on the substrate, used my magnetic cleaner on the glass, then vacuumed out what I could get. About the time I finished the light switched off, leaving a horrible looking tank with water so cloudy that it was impossible to even see the glo danios. This tank gets about an hour or two less light than the others but, as I mentioned, it also does (DID) get some sunlight thru the blinds. I stopped feeding Flourish about a month ago so there are no ferts added, and I do not over feed this tank, although I am guilty of overfeeding my livebearer tanks! I know BGA is a bacteria but where in the world does it all come from??? NONE of my other tanks have any at all, and this tank hasn't had anything added to it in months and months...in fact, it is my oldest running tank and has had these danios since late September. I faithfully do 30 - 40% water changes EVERY week, and the lights run on a Siesta schedule. Things like this make me feel like such a novice! Where did I go wrong??? BGA is pretty well everywhere. I am battling BGA in a 20g for almost two months and this weekend I have decided that I have lost the battle and will completely breakdown the aquarium. Not sure how it starts but many say that it is due to high bio load accumulation, low oxygen and low flow, with high lighting conditions. If we were absolutely sure of what "causes" BGA, we would be able to predict its occurrence. Well, there are certainly not too many fish in there with just a dozen danios (20 gallon). But, I did notice some of the lower leaves on the plants had begun to get smushy and brown and that sunlight was a new thing since my new kitten has decided to do her sun worship in that window and has separated the slats in the blinds. The first and only other time I had it was in my other 20G, and it has my White Clouds and Loreto tetras, again not overloaded at all and not over fed. It was only on a few of the plants and with three days of Excell it did vanish on its own, never to return (yet!) That tank did not have excessive light, however. Good luck, Alex, and glad to hear I am not alone!!! It doesn't take much nitrates added with some natural sunlight to turn a perfectly clean tank into a mess of green goo in no time. The tanks I have at work are in full sunlight inside a greenhouse and have a nice winter coat of the green stuff covering all the sides and bottom. However in this application it doesn't mater, the water is crystal clear and the fish pick at it if I'm not constantly standing there shoveling food in the tanks. A side note, if not for the UV I would not be able to see the fish. It's pretty easy to tell when the UV bulb packs it in. In just a couple of days the water starts to turn green. Yup, I'm sorry I pulled that unit and put it in another tank. Guess I need to buy another one? Considering the type of fish that I am keeping (wild livebearers) I purposely have high bioload tanks, ie detritus, algae and overgrowing plants. A perfect storm for BGA but all my tanks are fine and crystal clear except for one tank which had BGA creep in, take hold and then blossom. The key I guess is to eradicate as soon as you see it, whether cutting off the plant leaf or wiping and vacuuming the spot that grows on the tank, not letting it re grow. I really do not mind it, except when it blossomed and completely overwhelmed the plants. I was willing to take the chance as the X xiphidium were feasting on it, somewhat like yogurt culture. 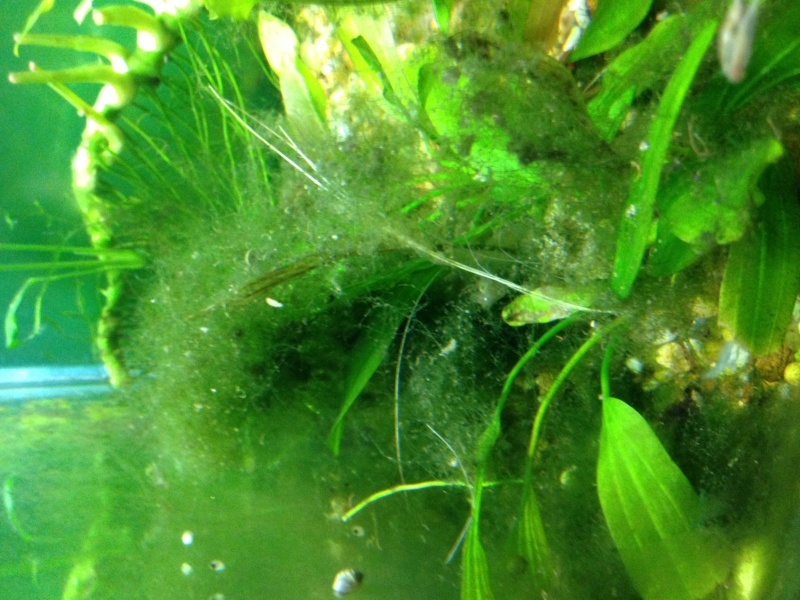 I had a small outbreak last year with the Tiger Teddy tank, and the BGA blossomed overnight. Again I was quite fine letting the Tiger Teddies feast on it and BGA performs well as a nitrogen consumer. The problem I see with it is that if you have a planted show tank, BGA does not fit into the pleasant picture. It is ugly and slimy and looks like ghostbuster jelly. When it dies off it creates a torrent of decay and consumes the oxygen starving fish or anything needing oxygen. Well, I keep fish, and I am not a show plant person. I am a slimy algae herder and proud of it !!! 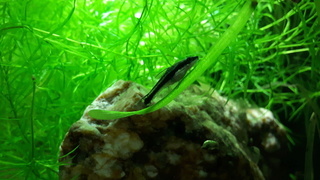 @alexmtl wrote: Well, I keep fish, and I am not a show plant person. I am a slimy algae herder and proud of it !!! I think the color is absolutely beautiful, but this tank is in my bedroom and is the first one I see in the morning and when EVERY plant, all the glass and even the gravel are shrouded in it, it became a bit much!!!! Unlike the black beard I had in the 55 gallon, it was on the peaks of the big castle that came with the tank and really looked neat. I was sad when it died off and vanished. We are a funny lot, aren't we? One man's trash is another man's treasure!! Guess ultimately that is a good thing! I have chosen to be a breeder of wild livebearers, and also have given thought as to how I will cultures these prized fish. Some breeders use very sterile tanks and plastic foliage for high output production. I have chosen to raise as colonies, in a natural biotope, or as close as can be. We often speak about the "N" word; nitrogen, nitrate, nitrite, ammonia, ammonium and blah blah blah. However not too many speak about the other, perhaps as equally important and in a thought provoking way, perhaps the defining cycles which have more influence with close to wild fish. In looking at the species that I keep, many come from drainage systems, essentially living sumps with high output organics and decomposing matter, all in balance. This heavy bioload environment is probably the ideal breeding condition for many of these fish. While I depend on what the reports and internet say, I try to replicate somewhat this environment, even in the absence of the appropriate plant species and soils. 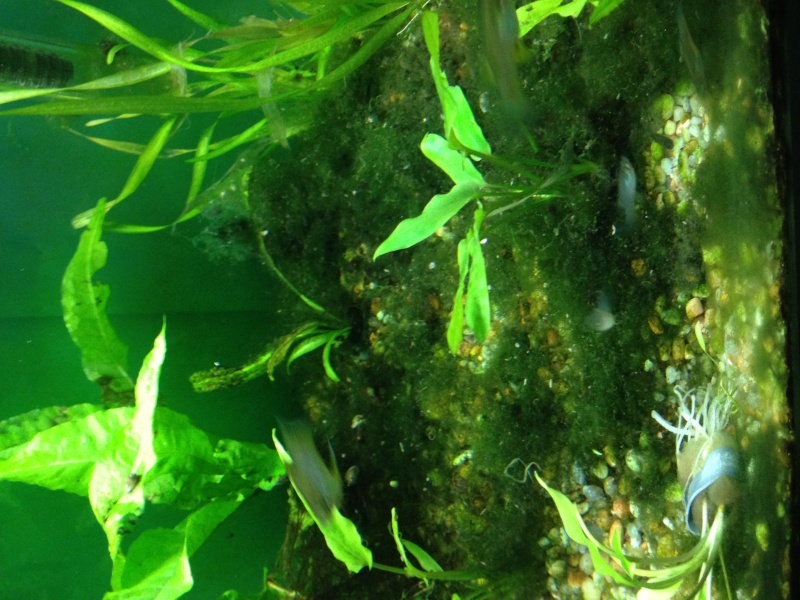 Here is an example of a balanced biotope, nitrogen levels "0"
The wild fish, X continens, Phallichthys fairweatheri are healthy, reproducing and quite well fed as they graze upon the organisms that I have inoculted into the detritus. There are visible signs of Paramecium multinucleatus, Bursaria and other protozoans which are large enough to be easily seen by the naked eye. 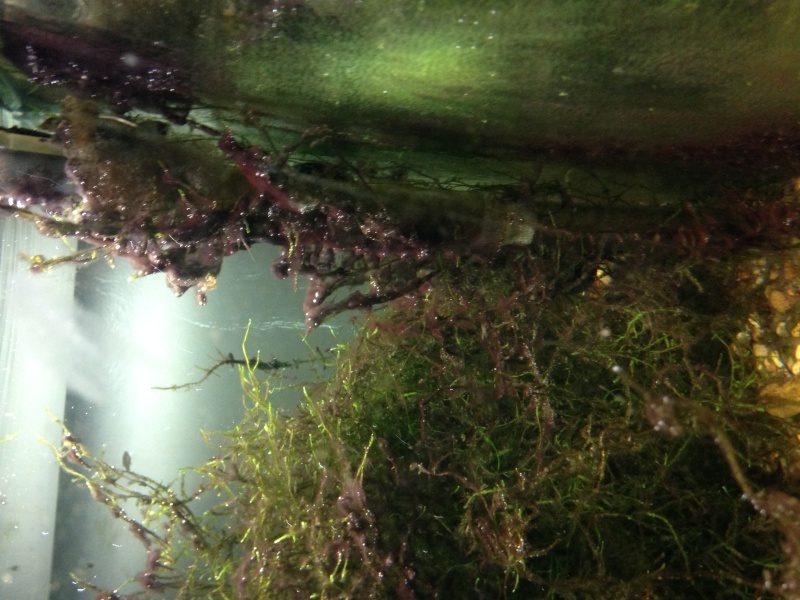 The carbon cycle is balanced and these mature tanks are a fertile environment for microfauna for the babies and adults. This was an ongoing battle that I gave up on about two weeks ago. The fish in this tank are busy grazing and chomping on the growth and their stomachs are full. Well, like I said, I breed fish. I take my chances when it comes to algae, BGA and jungle mania, but then I have a perfect storm and I am assuming that the BGA bomb can go off at any time. So take heart nyleveiam, you are not a guilty aquarist. Take consolation that I have the record for BGA ugly. Wow.. that is some serious algae. Also, my neck hurts. CanadaquariaAdmin wrote: Wow.. that is some serious algae. Also, my neck hurts. Yup. I am the BGA champ in the 'hood. I posted at an angle to prevent a full frontal assault on people's sense of decency. Hey, yours is purple... I want purple!!!!! @nyleveiam wrote: Hey, yours is purple... I want purple!!!!! Ha ! Took me two hours to scrub down and bleach. The substrate pebbles are in a large bucket that will be wshed out for the detritus and then chlorinated and then stored for re-use. The 20g is now being cycled through. I do not anticipate a problem with this one for a while. I'll try to salvage the java moss that has the purple goo(BGA). I will put into a gallon holding bin and see how it washes away with daily water changes. Bga is a real pain to get rid of. I read somewhere that it thrives in low Nitrates environment, low flow conditions. 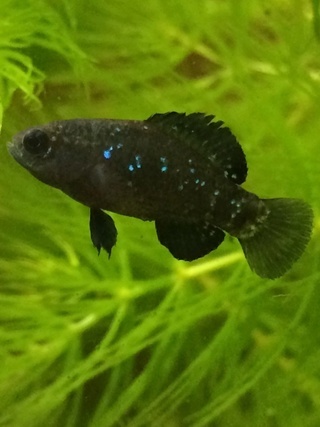 I am not a fan of adding products in my tank but when I realized it was killing my other plants, I declared full scale war on it and purchased a product called Blue Green Algae remover. One dose later, a few days after, no signs that I ever had bga..
Well, it's been three days since I removed my plants and cleaned everything... no sign of ANY BGA so I think I won that battle!!! I really hope this is it for you!